Barberino Val d'Elsa is located in Chianti, Italy, between Florence and Sienna in a dominating position on the ridge separating the watersheds of the Elsa and the Pesa rivers, both tributaries of the Arno. The town has retained its mediaeval elliptical shape with a main street running between the two turreted tower gates, the Porta Romana and the Porta Fiorentina. Two other streets run parallel with this main street and meet up with it again near the gates. The type of urban structure seen in Barberino Val d'Elsa is fairly common among the walled towns of the Elsa Valley (Val d'Elsa) and has remained basically intact, although the town walls have suffered some mutilations here and there. The two gates still exist, though the Florentine Gate is a modern copy. The Sienna gate of Barberino Val d'Elsa, commonly known as "di sotto" (below), is built in stone. It boasts an elegant Gothic arch, while a small 18 C brick belfry can be seen above the main walls. 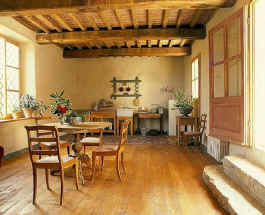 B&B rooms, vacation rentals, holiday apartments, villas with private pool for your holiday in Tuscany - click here. Barberino Val d'Elsa is mentioned in a document of 1054 belonging to the Abbey of Passignano as a fortress or village situated in the Parish of San Pietro in Bossolo. However the town really developed as a municipality in the first decades of the 13 C after the Florentine destruction of Semifonte in 1202. The history of Barberino Val d'Elsa as a centre of power in Tuscany, Italy, in fact hinges on the destruction of the castle of Semifonte. After a long siege, the castle was razed to the ground by Florence in 1202, and the Florentines forbade its reconstruction by anyone. Today a dome identical to the Brunelleschi cupola, but five times smaller, rises up on top of what was presumably the hill of Semifonte and stands as a permanent reminder of this tragic event. The razing of the castle of Semifonte, however, increased the importance of Barberino Val d'Elsa. 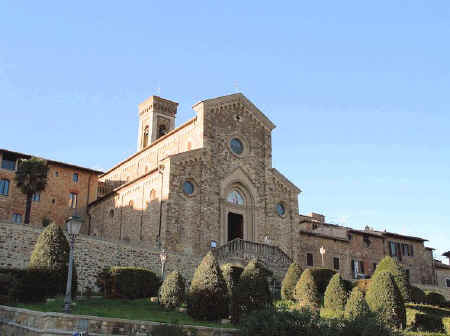 In fact, Barberino Val d'Elsa became the administrative centre of a "Barberino Val d'Elsa League", which included more than 30 villages located in the area between the Pesa and Elsa valleys. Florence surrounded it with defensive walls and transformed it into a military garrison. It then became part of the Florentine Republic and a Podestà was installed as governor. The main road that now runs past Barberino Val d'Elsa on the east once went right through the centre so that merchants and pilgrims naturally had to pass this way, often stopping overnight. This explains the presence of the Pilgrim's Hospice close by the Florentine Gate, commissioned in 1365 by Taddeo di Cecco, son of the poet and notary Francesco da Barberino. 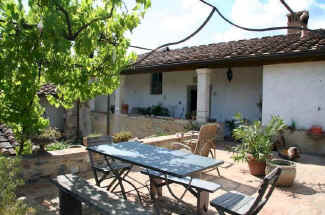 Vacation rentals near Barberino Val d'Elsa, Tuscany. Click here for a wide range of vacation rentals, villas and hotels near Barberino. Barberino Val d'Elsa © ammonet InfoTech 2008 - 2018. All rights reserved.